How to import a root CA certificate into certificate stores using "certmgr.msc"? I have the certificate in a PEM certificate file. 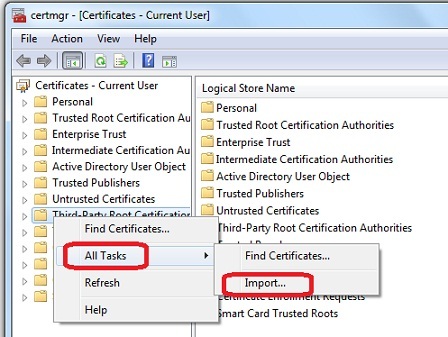 You can import a root CA certificate into certificate stores using the "certmgr.msc" tool as shown in this tutorial. 1. Start "certmgr.msc" Management Console on your Windows 7 system. 2. Locate and right-mouse click "Third-Party Root Certification Authorities" certificate store. You see context menu showing up. 3. Click "All Tasks > Import..." button. You see "Certificate Import Wizard" showing up. 4. Click "Next" button. You see "File to Import" screen showing up. 5. Use "Browse..." button to find the CA certificate file like "C:\fyicenter\SwissSign.cer", and click "Next" button. You see "Certificate Store" screen showing up. 6. Make sure "Third-Party Root Certification Authorities" is selected as the certificate store and click "Next" button. You see confirmation screen showing up. 7. Click "Finish" button to finish importing the certificate.